I wouldn't know where to begin when it comes to formally mapping a territory. Of course, it doesn't help that I don't have background in geography, cartography, or anthropology, but the scope of such a project must be enormous. Travel planning includes figuring out what you’ll see, where you’ll go, and how you’ll get there, and if one is being scientific about it, there are (theoretically) procedures to follow in order in order to impartially study a people, history, culture – whatever it is that one’s task is. In my previous blog entry, I focused on how I map my travels, but in a larger sense, mapping new landscapes, countries, continents, and people is part of the history of travel writing, and in many cases, it was part of the colonial mindset that would help travelers figure out how to define what they saw in terms they, their sponsors, and their readers could understand based on a limited understanding of cultural pluralism and cultural relativism. In a 1991 talk, Pratt introduces the concept of contact zones, which, as she explains, “refer to social spaces where cultures meet, clash, and grapple with each other, often in contexts of highly asymmetrical relations of power, such as colonialism, slavery, or their aftermaths as they are lived out in many parts of the world today” (34). There’s an inherent imbalance here: The travelers who came from far-off lands had the opportunity to describe a foreign people with whom they may not have been able to effectively or clearly communicate, and who therefore might not have been able to describe language, customs, food, religion, etc. the contact zone was highly politicized and unbalanced in terms of power. Historically speaking, the sociocultural complexities of the native people would have been outside the grasp of an imperial culture. Native and indigenous cultures were maligned and misunderstood, however unintentionally (and intention has a lot to do with it, although motivation does not necessarily justify the imperialists). There is more than one way to “map” when it comes to travel writing. Mapping the interior or the body is one way; mapping continents is done on a larger scale, but all this means is that cultures are visually depicted. Blanton notes that one difficulty is mapping faithful representations of foreign maps were done in familiar terms (1). Mapping is, of course, another form of narrative, and purposes of travel affect any such narratives – whether travel is done for exploratory purposes, for development, for economics, or, at the other end of the spectrum, for including social and psychological issues (Blanton 3, 4). Divergent purposes lead to different narrative structures. In other words, audience and motivation affects purpose of travel and travel writing, which affects narrative style. The issue at hand, relating to Pratt’s contact zones, is how to effectively analyze a culture to which we do not belong: Travelers’ motivations affect their ability to understand a different culture. Given travelers’ varying degrees of insider/outsider status and depth of knowledge of a culture, interpreting any given aspect can become especially complicated. 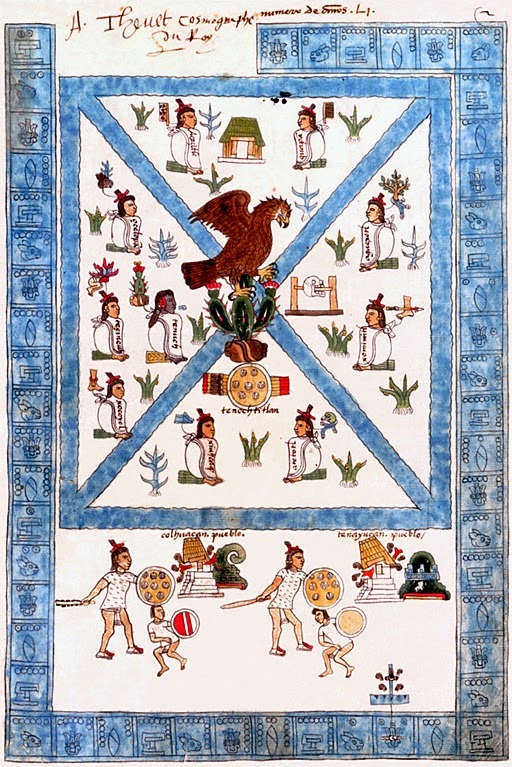 Leibsohnrecounts the complexities in analyzing a historic artifact (the Codex Mendoza, below), taking into consideration initial observations, contextualizing placement of an object or person, and finding sources for examining the ways a single work of art may have meaning, because, as she says, “[I]t’s important to realize that there’s no such thing as a single meaning for any particular object, any work of art, that there are always competing ones.” Considering the larger historical context and knowing which questions to ask are also important facets, and having this background could allow one to map a culture in terms of societal (mis)understanding.